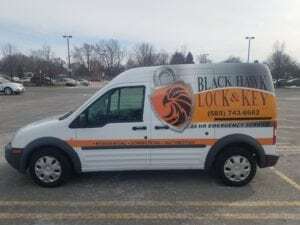 Black Hawk Lock and Key can now offer 24-hour mobile locksmith service to give fast and trustworthy assistance. Whether you’ve discovered that you’re locked out of your home or vehicle or you’d like assistance with installing a new lock or security system, you’ll want to be sure that you hire a trustworthy locksmith. Locksmith scams abound in Greece NY, and ensuring that you don’t fall prey to one in a moment of desperation will save you a significant amount of time, hassle, and money. Hire a Greece locksmith that has the proper certifications, tools, and experience to get your job done quickly while maintaining the integrity of your locks. We serve homeowners, drivers, and business owners in the region, providing high-quality service with integrity. At Black Hawk Lock & Key, we specialize in providing a full array of security solutions for area homes and businesses. We sell, install, and service top brands like Schlage, Alarm Lock, Marks USA, Kwikset, Arrow, and GMS. We have a mobile locksmith service, letting us meet you wherever you are in the event of a lockout, a broken key in your ignition, or any other locksmith emergency you may face. Our locksmiths are bonded, licensed, and insured, so you can enjoy the peace of mind that if a job doesn’t go as expected, we’ve got you financially covered. Finding a reputable locksmith before you need one is a great way to avoid getting scammed and ensure that you receive the quality and professionalism you deserve. We are members of a 1800-Unlocks, meaning that we have been screened and vetted by a third party, and our licensing, certifications and businesses standing have been reviewed. We are also listed in the Fair Trade Locksmith Directory, which is another third-party company that carefully screens and interviews locksmiths to verify correct licensing, proper tax filings, and more. There are situations that arise at your home where you may benefit from the services of Black Hawk Lock & Key. We offer a wide variety of residential locksmith services which include lockouts, lock repair and lock rekey. Getting locked out of your home is frustrating. You might be tempted to break a window or pick a lock. But, this can cause damage that is expensive to fix. Your best bet is to call Black Hawk Lock & Key in Greece, NY. We can get you back in your home without causing any damage. Rekeying your locks will allow you to use new keys with the existing locks in your home. The success of your business depends on keeping it safe from unauthorized access. It’s important for your locks to be in good working order. You may also want to upgrade your security. The first layer of protection for your business is the locks on the doors and windows. It is essential that your locks are in good working order. Whether you need new locks installed or repaired, Black Hawk Lock & Key can ensure the locks on your doors are capable of protecting your business from unauthorized access. There’s nothing more anxiety-inducing than having a problem with your car and being stranded. Our locksmiths can help you out in many situations including lockouts, stuck keys, and ignition repair. And, we’ll come right to you. If you’re locked out of your car, don’t panic. Just call Black Hawk Lock & Key. We’ll come to you and have you in your car and on your way in no time. If a key is stuck or broken in a lock or the ignition, don’t try to extract it yourself. This can do more harm than good. Our locksmiths can extract the key so you can get on with your day. No matter what your locksmith needs are, our local locksmiths will take care of you. They have extensive training and will provide you with professional and affordable service. If you want to learn more about today’s cutting edge security technology, schedule a lock repair or installation, or get fast help for an emergency lockout, give Black Hawk Lock & Key a call. Our friendly, experienced professional locksmiths are here for you, ready to meet you wherever you are to provide high-quality service. Contact us today to learn more.